MY ORDER -BOOK IS TEMPORARILY CLOSED. I am truly grateful to each and every one of you who have sent me -- and who continue to send me -- good wishes for my well-being. Your thoughts are greatly appreciated. Bottom line: I've been diagnosed with Parkinson's disease (you can look it up on Google) and that, together with badly failing eyesight, plus age (I was eighty-three in August) means that I can no longer work as fast as I used to. Yes, I intend to go down swinging and work for as long as I can, so all I ask is that you help by being a little patient. The fact is that, despite my best intentions, I'm spending more time trying to cope with failing health than I am in positive leather production in my workshop. Unfortunately, my six to eight week turnaround can no longer apply, but even though I've tried to keep it as short as possible, I realize I'm fighting a losing battle . Despite my optimism, I must face the fact that my condition is not going to improve in the forseeable future, so I've reluctantly decided that the only fair thing would be for me to close my order-book while I try to deal chronologically with the orders I already have. I will post updates on this homepage from time to time, so please check. PLEASE SEND NO MONEY. I will ask for payment only when I start work on your order. I apologise for any inconvenience, but it has been unavoidable. To use the order form, use this link or any of the Purchase Information links throughout the site. In the meantime, I am always available for all queries and enquiries, so if you have any questions about anything at all, please don't hesitate to email me. Thank you for your understanding and your patience. Special: Revolver Shoulder Holster Horseshoe Leather Products is a one-man enterprise where old-world craftsmanship, based on forty-five years of hands-on skill and experience, are successfully combined with the finest English leather and the latest modern technological methods of production to create some of the most elegant and supremely functional concealment holsters available in the world today. Every single holster bearing the Horseshoe logo is designed and handcrafted personally by me, Andy Arratoonian, from start to finish. My guarantee is that I make each holster as if it were intended for my own personal use, and that my very life depended on its performance! 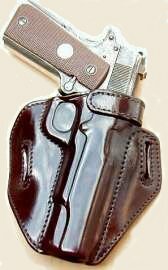 Here I have tried to provide all the help I can in assisting you with holster choice, the holsters available for particular weapons, guidelines on holster selection, details of holster design, plus contact and postal information. There is also a FAQ section which probably has answers to most of your questions, but also an invaluable series of in-depth articles, including one on the relative merits of cowhide and horsehide for the manufacture of holsters. Combine all this with my complete range of custom-quality concealment leather for over one hundred and fifty different models of semi-auto and you've got what is probably the most helpful and user-friendly holster catalogue on the Net. "The Finest Handmade Holsters in the World!" "An established authority on the concealed carry of handguns, he is a world renowned master holster maker who markets his handmade rigs through Horseshoe Leather Products."